'Burgundy Lace’ is noted for its showy spring fronds that emerge in a soft but stunning burgundy-purple with silver streaking. 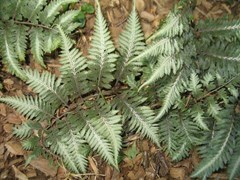 Fronds gradually mature to grayish-green, but retain purple mid-ribs and silvery sheen. U.S. Plant Patent PP15,072 was issued on August 3, 2004. Woodland gardens, shade gardens or shaded border fronts. Also effective in shaded areas along streams or ponds.